Anyone who read my article about food dates a few days ago may have noticed that a few of the best-by dates on my food had already passed. Not to worry, I will get to all of them before they actually expire. My heavy cream was well past it’s date, even passed it’s eat by date at 12 days. I had stored it properly in the back of the fridge, but still wouldn’t dare use it to make whipped cream. It was very thick, a huge lump was just beginning to form in the center, but there was no smell of foul play. I decided that, to be safe, it needed to be cooked. So, I decided to experiment with making scones and was very glad that I did. I used to buy scone mix when Harry & David would put them on sale (usually because they were nearing their best by date) but then both stores near us closed down. If I knew then how quick, easy and cheap it was to make scones from scratch I would have been making scones back then instead of paying for mixes which weren’t any easier to make than these scones nor were they any tastier to eat. These scones are slightly crispy on the outside and super-moist on the inside. 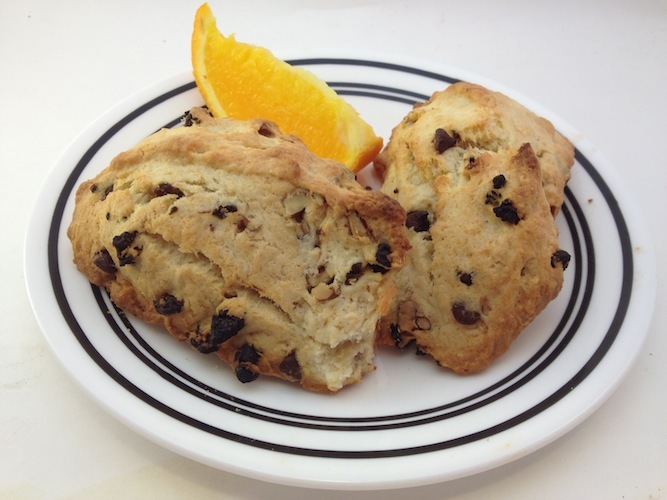 These are the easiest and yet the tastiest scones you will ever make! HOW TO MAKE SCONES, actually how to make easy, moist and delicious cream scones! Dump the first 4 items listed above into a bowl and then add 1&1/4 Cups of whipping cream or heavy cream. Add whatever additions you like in scones (see the suggestions listed below). Move the scone mixture to a lightly floured surface (use your floured hand to grab the ball, it won’t stick) and knead a few times. Kneading is pressing it against the surface with the heel of your hands and then folding it on top of itself and pressing it down again. Just do this a few times (3-4). 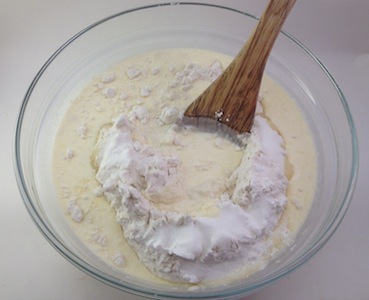 Too much stirring or kneading you will make your dough tough, and thus your finished scones hard. You can do this step right in the bowl without transferring if you don’t mind a knife to your bowl, the scones come out perfectly dome shaped (see the note below). Form a flat rounded circle (slightly higher in the middle) and then Cut the circle into separate triangles like a pizza. Grease a cookie sheet and place the triangles there so they are not touching, but fit them onto one cookie sheet. Bake the scones in the oven at 425° for 15 minutes. Nothing at all – make plain scones and then add jam after they’re cooked. But, my personal favorite additions when making scones is the combination of dried apricots, toasted pecans and white chocolate. I didn’t have any white chocolate so I used mini semi sweet chocolate bits here and they came out just as good. I liked the tiny bits of chocolate in the baked scones. To toast pecans before adding to the scone mixture, just spray a pan with olive oil and cook them over low heat until they’re golden. Not a necessary step, but does add some crunch and flavor. So, that’s how to make scones the easy way. This recipe makes scones that are crispy on the outside and soft and moist in the middle, not dry like a lot of scones that you can pay $2-$3 apiece for at coffee shops. This whole batch probably cost somewhere around that price, maybe less considering you might have just thrown out the cream. NOTE: If I’m feeling extra lazy, yet still wish to make scones, I don’t even transfer the scone mixture to the cutting board. 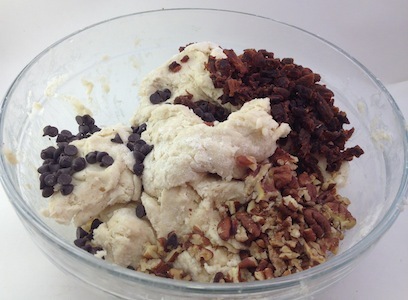 I just knead it in the bowl and cut (or pull) off pieces to place directly on the pan. I really love one bowl recipes, especially when it comes time for clean-up and I can place the scones in the oven and then quickly wash the one bowl and be done with making scones. And there’s just nothing like fresh from the oven – Enjoy your fresh homemade scones! 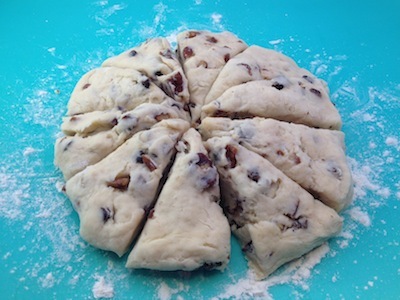 For another fresh baked item that prepares in one pan, try our simple pie crust recipe.